Officials at the launch ceremony. Dow Chemical Company has announced the launch of its newly-built innovation centre located within the King Abdullah University of Science and Technology (Kaust) premises in Jeddah, Saudi Arabia. Located in Kaust’s Research and Technology Park, the Dow Innovation Centre will support the company's ramped-up research efforts to address critical needs in the kingdom and the region including increasing energy efficiency and minimising environmental footprint. The hi-tech facility was inaugurated at a grand ceremony in the presence of Dow's executive leadership, the Kaust board of grustees, university leadership, and special invited guests from Saudi Arabia. The 13,500-sq-m space, which is designed to achieve Leed (Leadership in Energy and Environmental Design) Gold Certification from the US Green Building Council (USGBC), will house Dow’s Research & Development facilities and the newly established Dow Digital Marketplace Center for the region. The vision for a Dow's Saudi centre was born at the start of the two partners’ relationship in 2009, when the US firm became a founding member of the Kaust Industrial Collaboration Program, which works through close academic-research-industry partnership to commercialize research breakthroughs into practical applications and solutions for the market. The centre’s completion marks a significant stage in the growth of the Kaust Research and Technology Park, which is home to leading companies from Saudi Arabia and around the world. Nesma and Partners Contracting Company was the official contractor for the Dow building, while architectural firms HOK and Kirksey Architects had designed the exterior and interior of the centre along with Vanderweil Engineers delivering the MEP engineering. 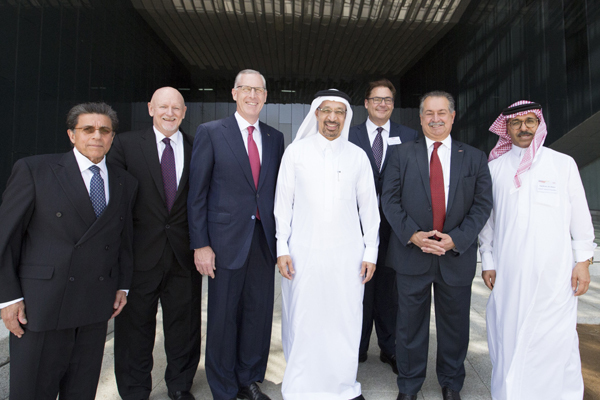 Dow Saudi Arabia President Chuck Swartz said the new Dow Innovation Center marks the culmination of a decade-long journey to have a dedicated facility focused on innovation and talent development to support the growth in the kingdom. “This facility is perfectly aligned to Dow’s strategy and our commitment to this region, employing a highly skilled workforce, a number already are graduates from Kaust with diverse backgrounds in science and engineering,” he noted. Kaust interim president Nadhmi Al Nasr said: "The innovation centre represents yet another milestone in Dow’s deep and growing commitment to the kingdom and region, which I am proud to say has been largely supported and facilitated by its partnership with Kaust over the years."